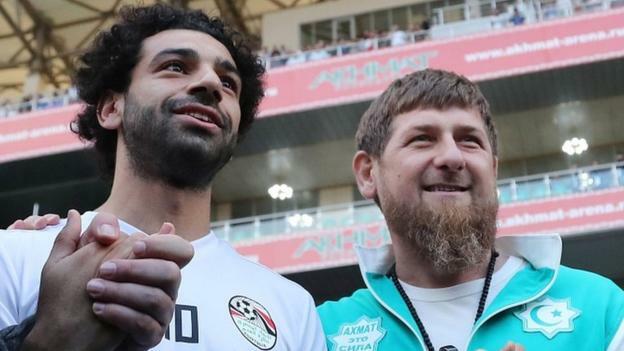 Chechnyan leader Ramzan Kadyrov used Mo Salah for “political capital” after being pictured with the Egypt forward, says an anti-discrimination chief. Egypt’s World Cup base is in the former war-torn republic of Russia, where Kadyrov’s regime has been criticised for alleged human rights abuses. European body Fare said Fifa has made a “big mistake” in allowing Chechnya to host a World Cup training base. Kadyrov defended his human rights record to the BBC earlier this year. Speaking in January, he insisted all reports of extrajudicial killings and torture of gays in Chechnya were “made up”. Football’s world governing body Fifa has always maintained its commitment to protecting human rights and earlier this year said it had “no grounds to believe that the choice of the Egyptian FA to locate its base camp in Grozny will cause particular adverse human rights impacts”. However, executive director of the Fare Network Piara Powar told BBC sports editor Dan Roan: “We have raised concerns about Chechnya being a training base for a long time. “If you know Kadyrov and follow the way he runs the region then you knew at some point he was going to try to gain some political capital, and I think he’s done that. “The allegations flying around about how gay Chechens have been tortured and killed, their families persecuted, this is not a good moment a day or two before the World Cup kicks off. And Amnesty International said the photo with Salah was “pure sportswashing”. Allan Hogarth, Amnesty’s head of policy and government affairs, added: “Ramzan Kadyrov was always going to see Mo Salah as a walking photo-opportunity, but Liverpool and Egypt football fans should look at the reality behind this cheerful-looking photograph. “During Kadyrov’s authoritarian rule in Chechnya there have been a stream of reports of enforced disappearance, of detainees being tortured and even extrajudicial executions. Campaign group Human Rights Watch has lobbied Fifa over its decision to allow Chechnya to host a training camp for the World Cup.